Chicago Mayor Rahm Emanuel and the city's top cop Supt. Eddie Johnson urged Chicagoans to "hear each other and partner with each other" as a verdict was read in the trial for Chicago Police Officer Jason Van Dyke, who fatally shot Chicago teenager Laquan McDonald nearly four years ago. "Today, the jury reached its verdict. As we absorb their decision, let us continue to hear each other and partner with each other – as public servants, police and members of the public – and let us ensure our collective mission is what endures for generations to come," Emanuel and Johnson said in a joint statement released minutes after the verdict was read. "We come from many neighborhoods, many walks of life and many places throughout the world. But for all of us, this is our home. This is the city we love. We have heard that message countless times in recent days and weeks in church basements, in community meetings and from residents in our neighborhoods. And while the jury has heard the case and reached their conclusion, our collective work is not done. The effort to drive lasting reform and rebuild bonds of trust between residents and police must carry on with vigor." 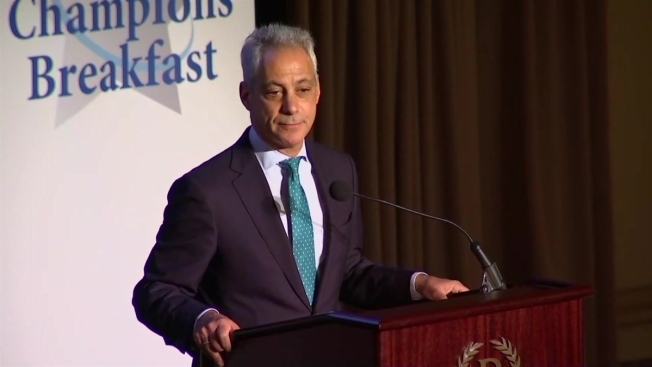 Earlier in the day, Emanuel urged residents to be respectful in wake of the verdict. News of the verdict came in just before 1 p.m. and it was read about an hour later. Chicago Police said the department has spent months preparing for a potentially controversial verdict and promised a "comprehensive operating plan" to make sure the city is safe. Schools prepared for early dismissals should the verdict be announced during school hours, as well as the cancellation of after-school events and potential cancellations of classes. Some groups have called for protests if Van Dyke was acquitted of first-degree murder charges. Van Dyke faced two counts of first-degree murder, 16 counts of aggravated battery and one count of official misconduct for firing 16 shots at McDonald the night of Oct. 20, 2014. Van Dyke pleaded not guilty in the case. Following the verdict, Van Dyke's bond was revoked and the Chicago officer was taken into custody.